The author’s ancestors in Australia all came from the British Isles. Two came on the First Fleet in 1788 and none came later than the 1830s, or were less than great-great-grandparents. In the direct lines, the author has found nine convicts. He traces the life of each direct-line ancestor against the social and historical background of colonial Australia, giving a very different picture from that usually found in school history books. The story is not just for family members. The author embarks on a journey through Australian colonial history while his ancestors gradually emerge in flesh and blood from the bone-dry documents and newspaper reports. It is surprising how much he has found out about them – joys, successes and tragedies. Their lives were anything but dull. For example in the Wilson line, convict James Joseph Wilson arrived in Port Jackson on board Prince Regent in 1827. The author traces his redemption from the time he was sent out to Mudgee to shepherd the flocks of Robert Lowe, one of the Colony’s early landholders. He tells how James Joseph, who narrowly escaped the gallows and was surprisingly literate for a man thrice convicted of burglary, teamed up with fellow convict Michael Jones, how they married sisters Jane and Elizabeth Harris, daughters of free settlers from Wiltshire, and travelled out to the Coonamble area to set up their own farms. He explains how the two convicts and the Harris sisters all became his great-great-grandparents. In addition to telling an interesting, sometimes gripping family story, the author’s aim is threefold: first, to discover the cultural continuities in which his ancestors acted and how they responded to those continuities in a totally different physical environment; second, to discover to what extent the outlook, culture and character of the author’s ancestors worked to make him and his extended family what they are. And, perhaps most importantly, to sketch a picture of the way Australia developed as a people and nation. In 1950, most Australians had a ancestry similar to the author’s. That would change. 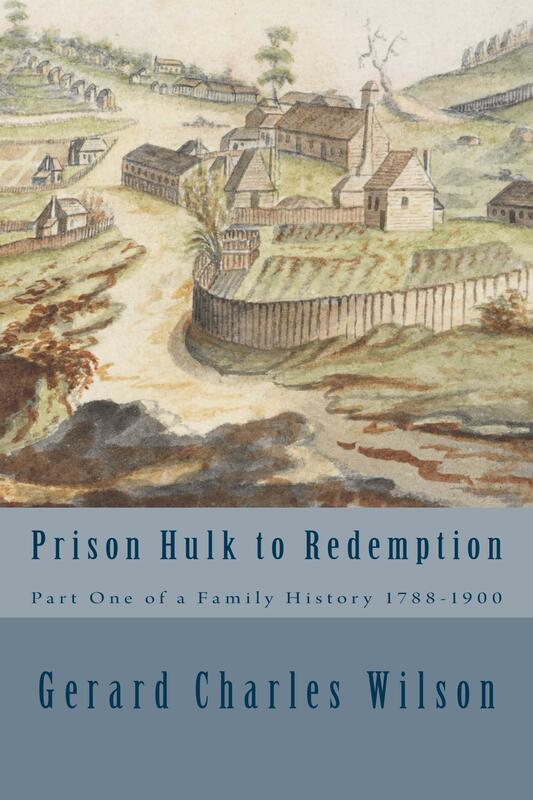 Prison Hulk to Redemption is the first in a series of four family history books – see below. Paperback available via this website A$24.95 plus postage. Please email order to gerardcharleswilson@gmail.com. Payment via PayPal or direct deposit.